This salad was the perfect solution. It’s absolutely delicious, so filling and tasty and incredibly cheap to make. I bought the smoked mackerel from Tesco and it was only £2.00 for three fillets. Even though this was a ‘salad’, it felt like a nice fulfilling evening meal and its one I will be making on a regular occasion from now on! Pop your potatoes on to boil in salted water for around 15-20 minutes (until nice and soft). Meanwhile pop all your dressing ingredients into a large bowl and mix up. Season well with salt and freshly ground black pepper. Chop the rest of your ingredients then take the green beans and pop in a microwaveable bowl. Cover with a 3 tbsp water and pop in the microwave for two and a half minutes so they steam nicely. 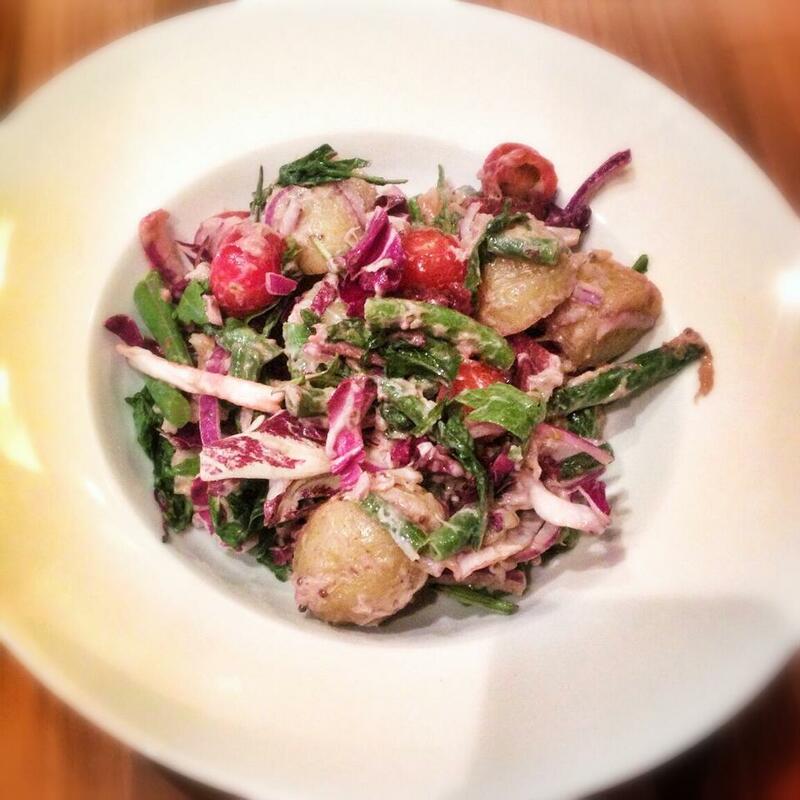 Once your potatoes are cooked, drain and pop into the bowl with the dressing and toss everything together. Add your tomatoes, green beans, onion and beetroot and flake in the smoked mackerel. Toss again. Pop a bed of leaves in the bottom of a bowl and toss a few handfuls through your salad mixture and then pile into your bowls. I made this for dinner tonight. It was really nice, filling & very tasty. Hi another brill recipe. Partner said “super yummy”. We enjoyed it a lot. So quick , simple & enjoyable. Keep up the great work! So glad you both liked it Gemma! This is my fav recipe, I made it and took half to work cold for lunch on a bet of salad and spinach and it is lovely cold.